Info "Line up your putt to make a birdie." Micro Golf is one of Jimmy T.'s microgames in WarioWare: D.I.Y. The game is based on the sport of golf. 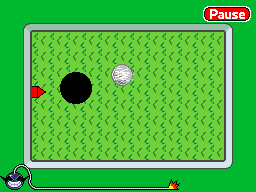 To win the game, the player has to sink the golf ball into the hole. To do so, they have to tap anywhere on the stage when the red arrow is aiming to the hole. If time's up or if the player misses, the player loses.